I love receiving mail from Billie Jo. 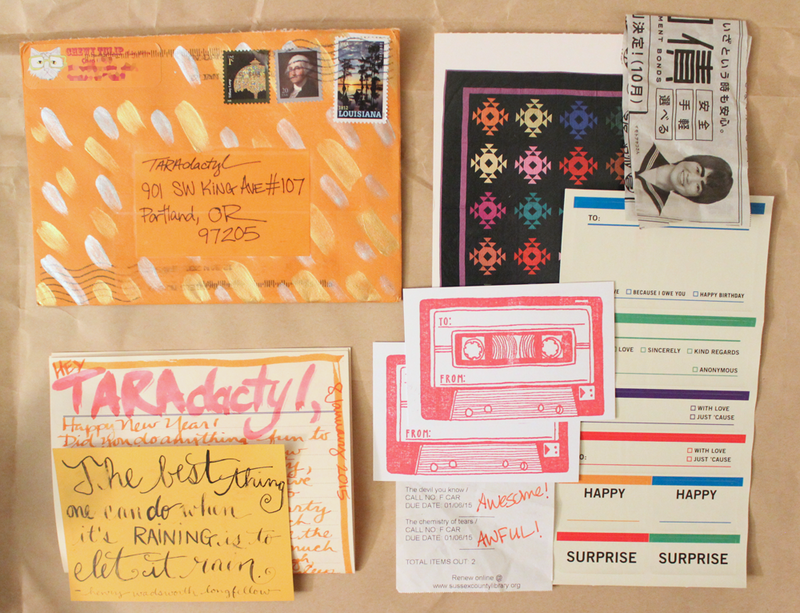 We met through Instagram and I had never seen a picture of her mail art before so I had no idea what kind of postal treat she would send my way. 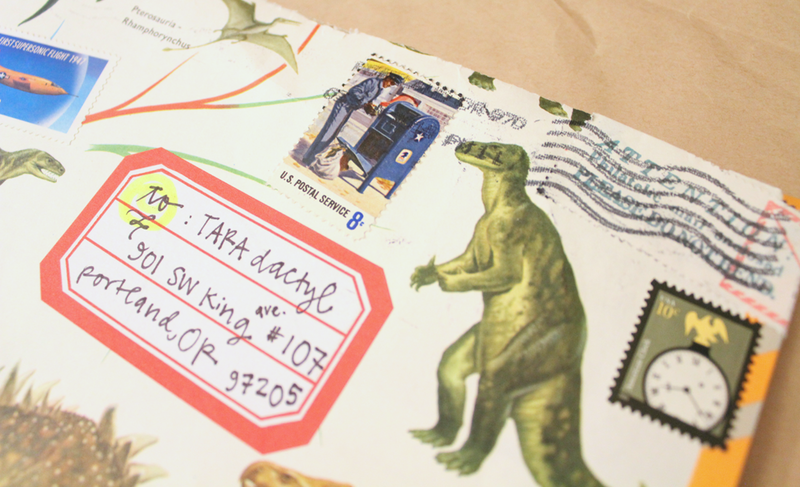 She does incredible stitching on her envelopes and it’s just so beautiful! 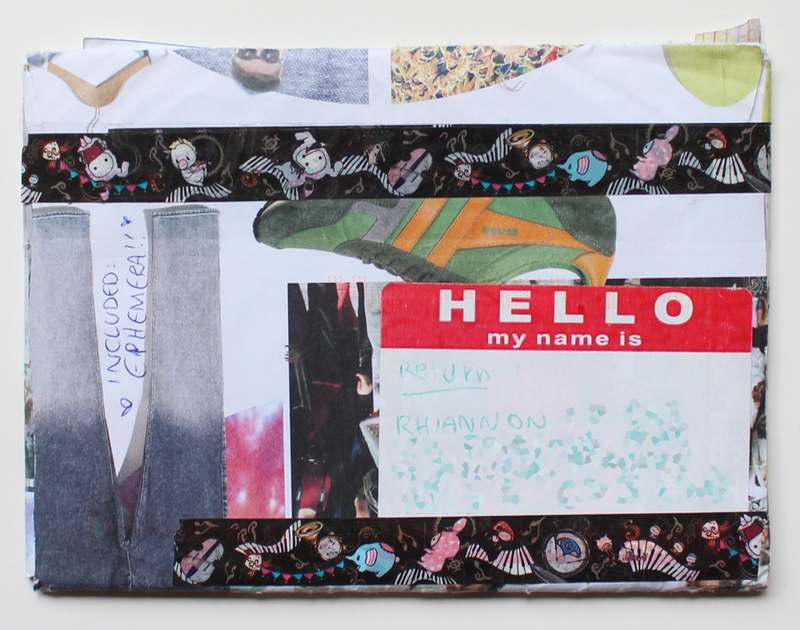 She does the stitching on the sides, around the address, everywhere. 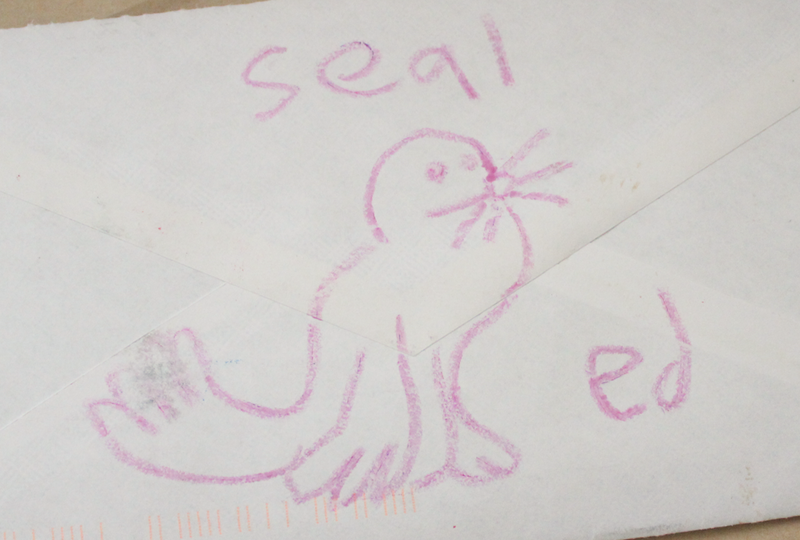 This type of mail art is not something that I receive often so I’m always really impressed by it. I feel like it must take so much time! And paper is so delicate so you have to be careful. I always have to run my fingers over the string. 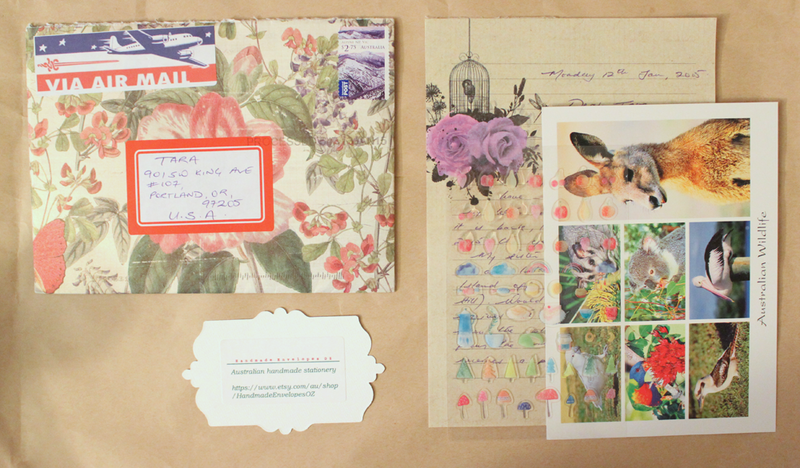 In addition to sending really beautiful mail, Billie Jo also sends amazing things in her envelopes. 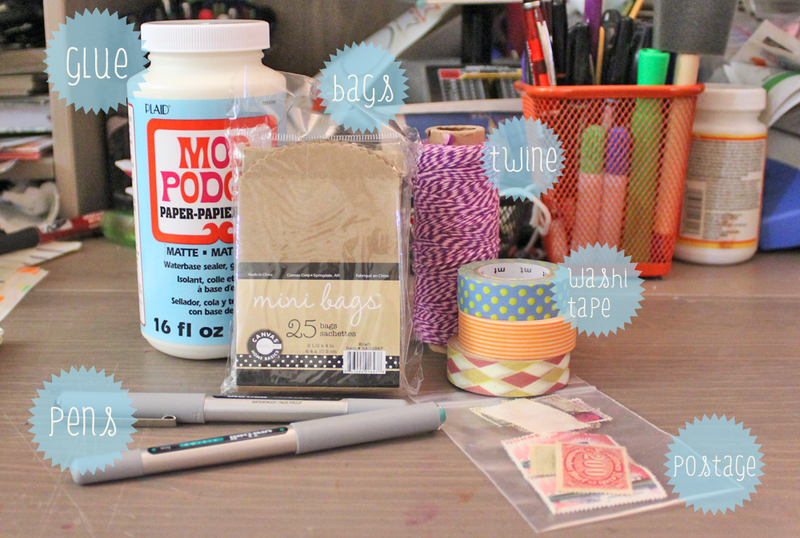 She made the journal pictured below as well as the super cute shaker card. I recently sent mail to a lady named Marissa. I met her through Twitter when she was looking for someone in Portland to go on a top secret postal mission. I quickly volunteered and sent her a little package with my findings. I never heard from her whether she got the package and assumed it got lost in the mail. 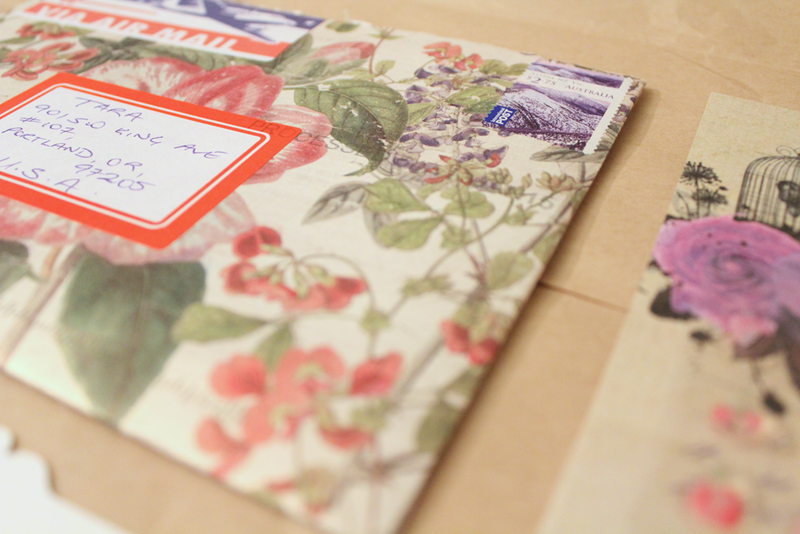 Well, I recently found out she did get my package because she sent the most lovely mail in return. Look at that package! I mean, it has everything you could want to receive in the mail. 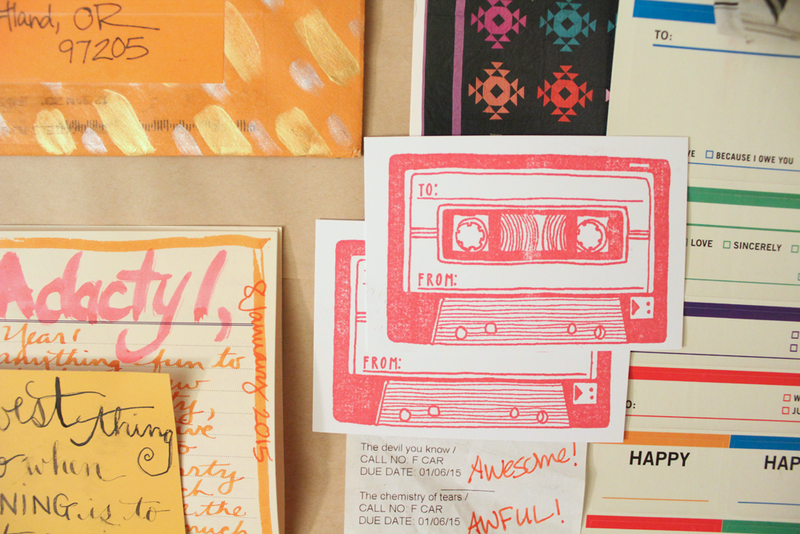 A beautiful words, zines, something handmade, and something unique. 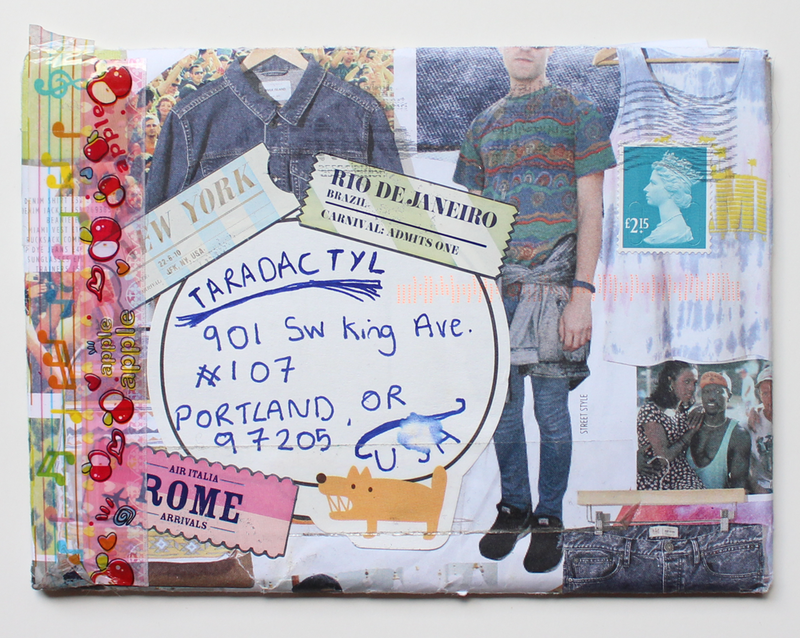 If there was such a thing as mail art bingo, I would’ve definitely called bingo with this package. 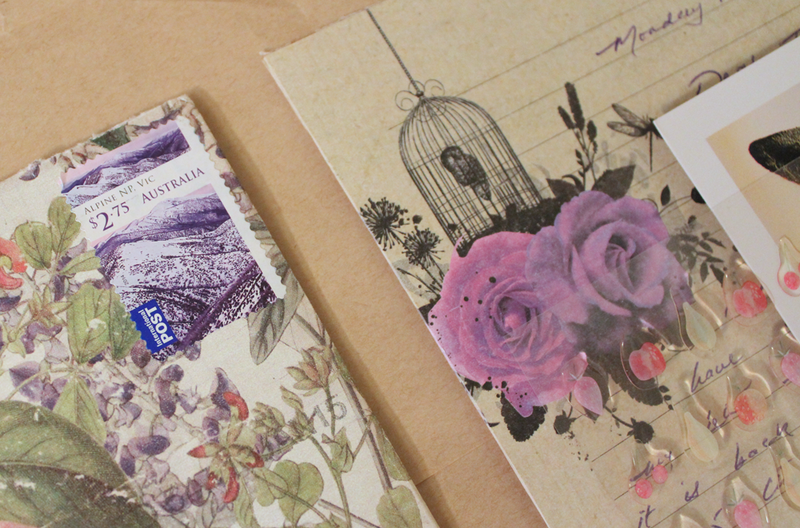 I was really excited to receive something back from Marissa and super, duper excited to receive something so wonderful. 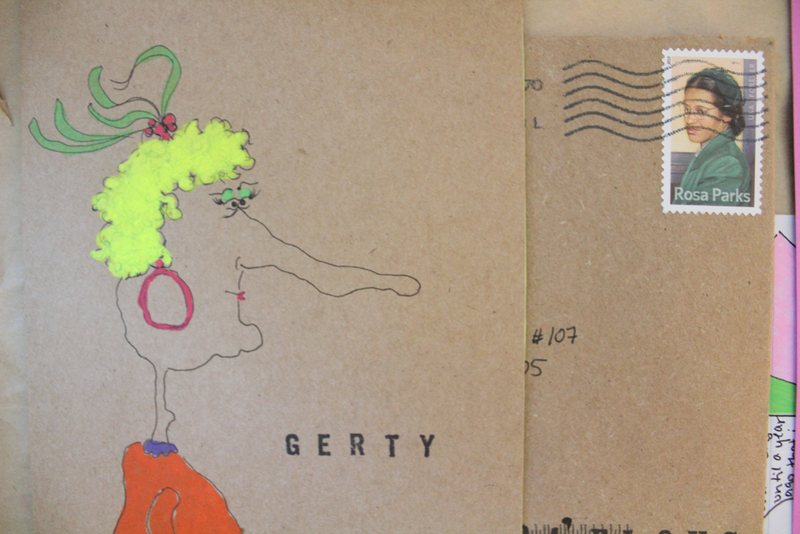 I received this amazing piece from Kate, my first piece of mail art from her! She actually ordered some goods through my shop and that is how we ended up exchanging mail. One of my favorite things about the internet! I’m never surprised at the creativity of folks but I’m always amazed that I’m the recipient of these missives. I absolutely love everything she included in her letter. 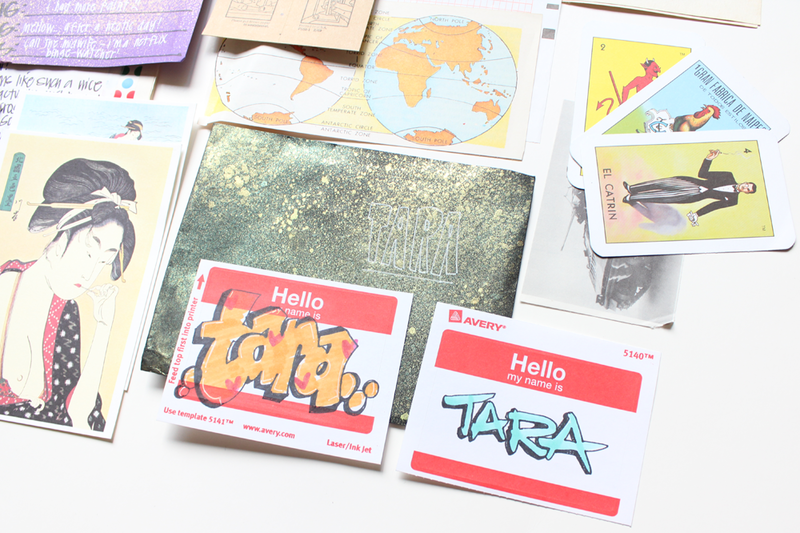 Her handwriting is fab and lettering on the Tara stickers is spot on. I wish I could be that talented! 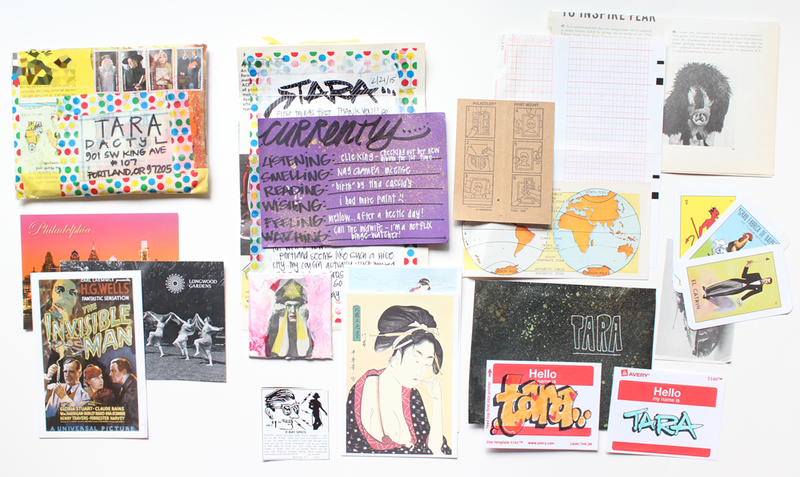 I can’t wait to start incorporating the bits she sent me into collages. I love it all! Kate has an Instagram dedicated to her art. I suggest you give it a peek! Although I don’t want to play favorites, Rhiannon is definitely high on the list of people I love to receive letters from and people I love to write to. I thought we had met during my time in the League of Extraordinary Penpals but it turns out she actually wrote to me after reading my blog all the way back in 2012 (this is why I keep spreadsheets of incoming/outgoing mail, btw). I honestly can’t believe it’s been that long! Rhiannon is seriously cool. 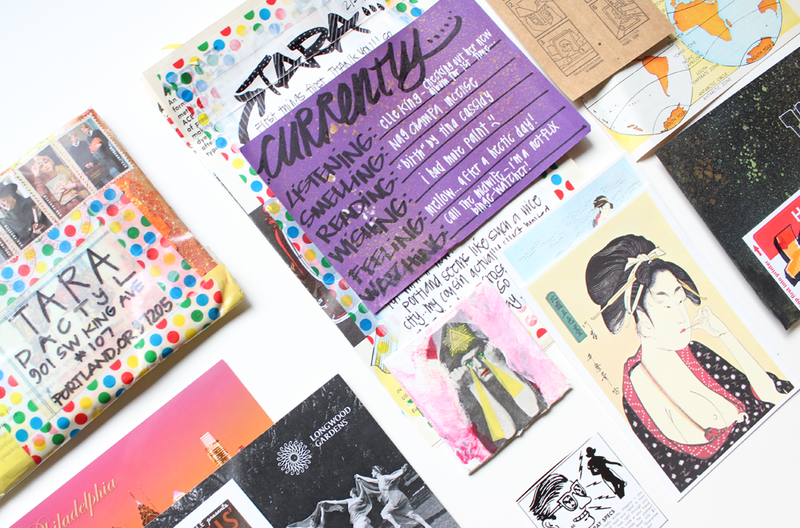 She shares her book/music/movie recommendations with me and doodles in her letters. She once sent me a mix cd that I listened to straight for months; her taste is exceptional! Lately she is doing the school thing so I don’t get to hear from her too often but it’s always a treat when I do! I suggest you check out her tumblr and see how cool she is! To be honest, I have no idea who these people are. Alyssum and Mudhead sent me this envelope with a couple of drawings and a request for mail art about “seeing good magic”. I assume they found my address through my blog, since the envelope is addressed to Dactyl Life. No matter, I love surprises and mysteries when it comes to mail. I really enjoy these strange drawings. 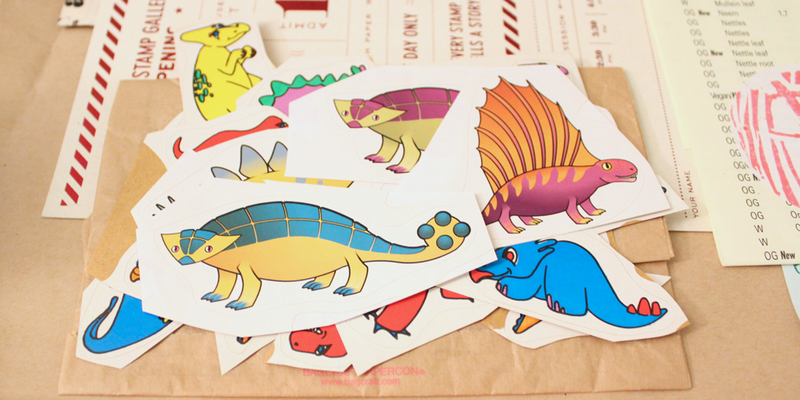 They are different than what I usually receive in the mail and I love that. 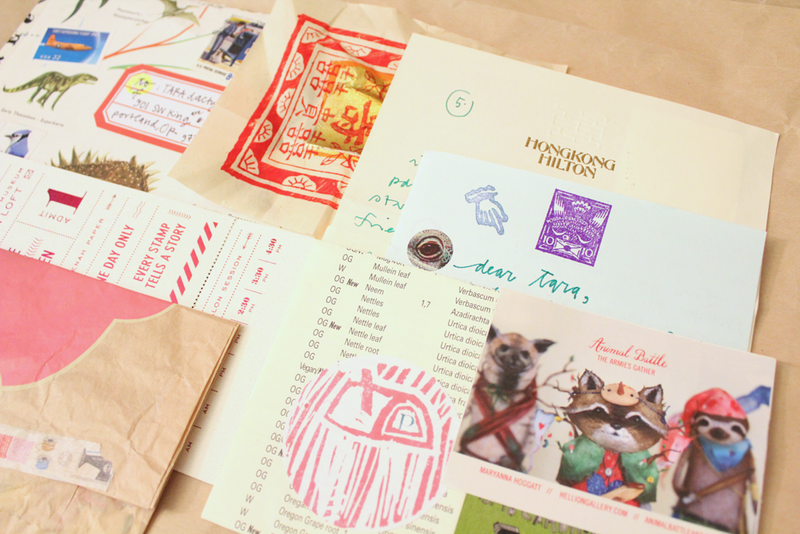 I’m much more a fan of the weird or unusual over this trend of “happy mail”. Don’t get me wrong, I love anything I get in the mail! This type of art just appeals to me a bit more. So, I don’t know anything about these people but I did a bit of Googling (gotta love the internet) and found their blogs. 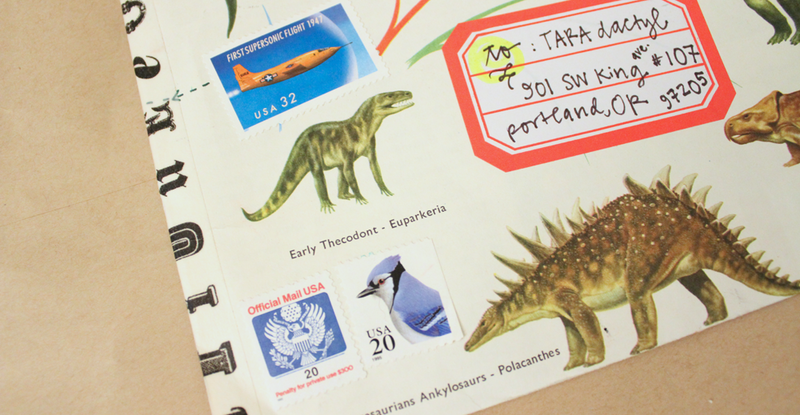 Wherever you are, Alyssum and Mudhead, thank you for the mail! I am sending some good magic mail art your way soon. Courtney is a really nice lady from Australia. I’m not sure how we started writing each other; all I remember is receiving a really lovely letter from Courtney a few years ago. She has really pretty, cursive-like handwriting. She signs her letters “yours in writing” which I always thought was really wonderful. We had been estranged pen pals for a couple of years but recently reunited via Twitter! She found my Twitter account and added me. I couldn’t believe it! That is a great way the internet aides us letter writers. 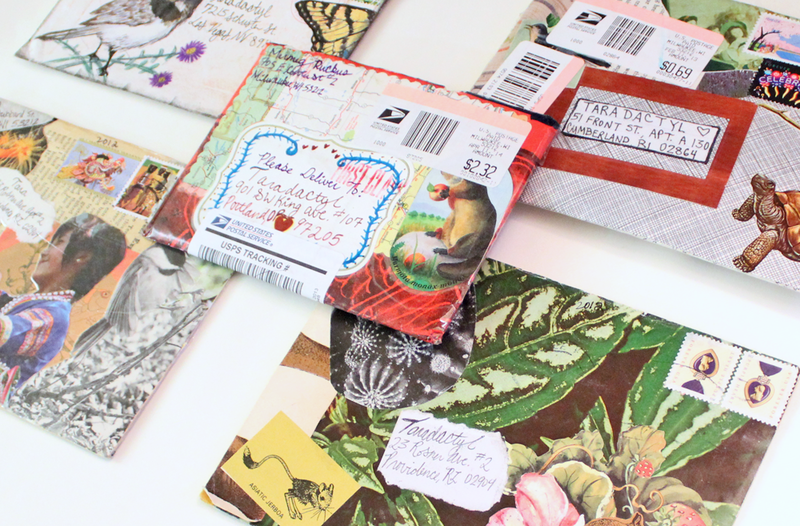 Courtney has an Etsy shop where she sells her handmade envelopes. She has a really awesome selection, check it out! Cara is a cool lady from New Jersey. I think we met through the blogsphere. If I recall correctly, she sent me the first letter (because I’m really bad at randomly sending letters to people these days). However we met, I’m happy that I get letter from her in my mailbox! She has a funky style that I love! 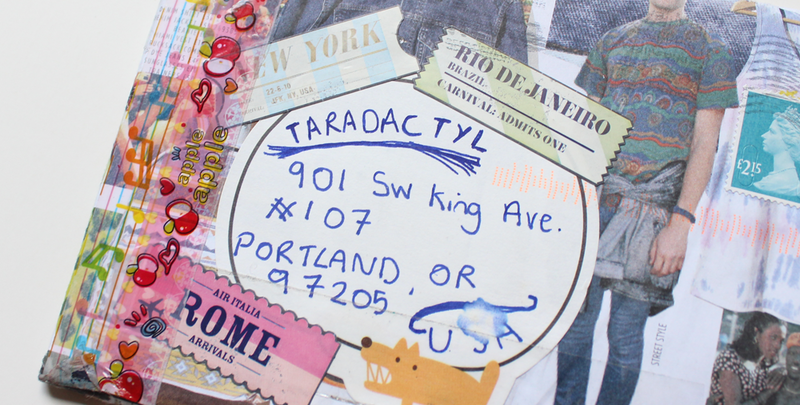 Cara’s address labels never fail to cheer me up – look at the hipster kitty cat face. 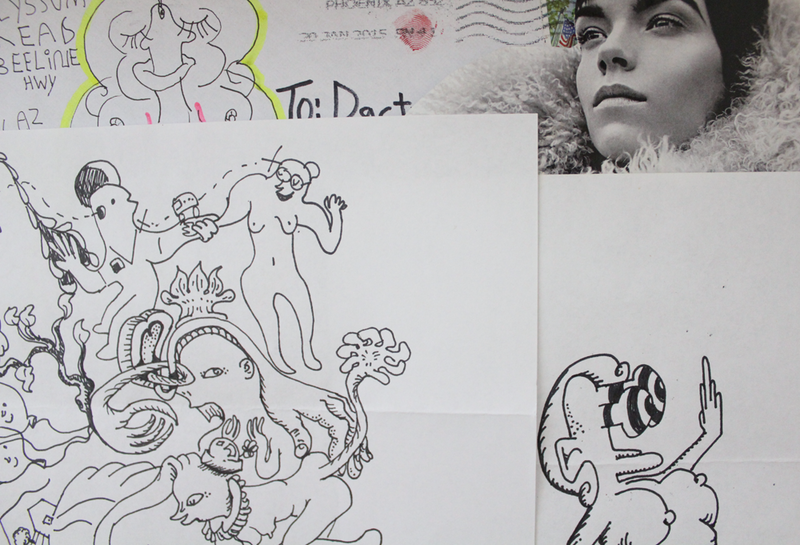 There are always fun doodles on the outside of the envelope, and even better ones in the letter. Cara has a fun blog and an Etsy shop! You should check them out. I just met Miss Polly in the post but I can already tell she is a super rad lady. 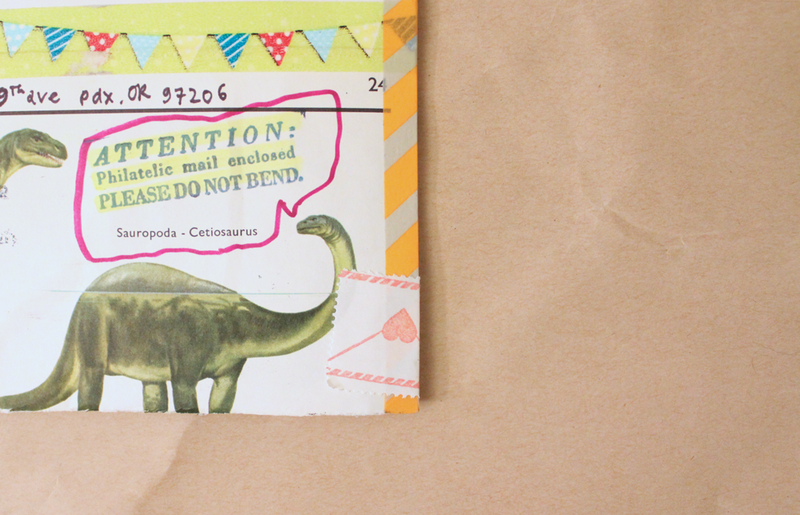 I mean, she did send me a dinosaur envelope after all! Polly commented on a blog post awhile back and that’s how we ended up writing each other! 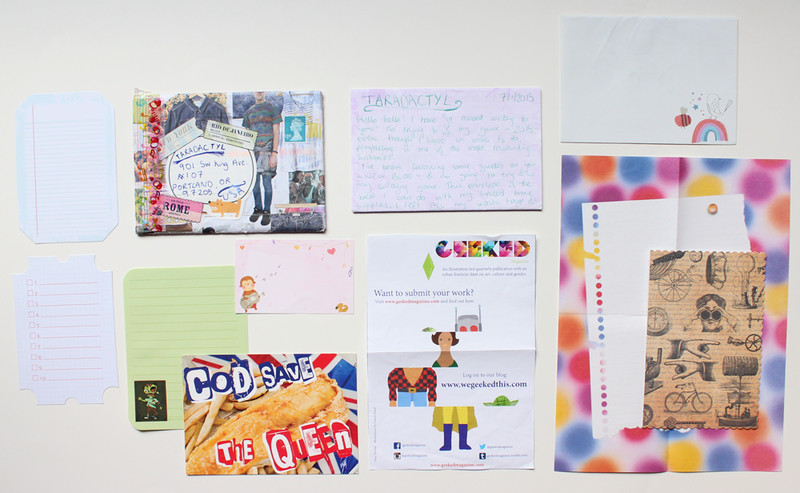 I sent off my first letter to her a few weeks ago and she sent me this lovely letter in return. 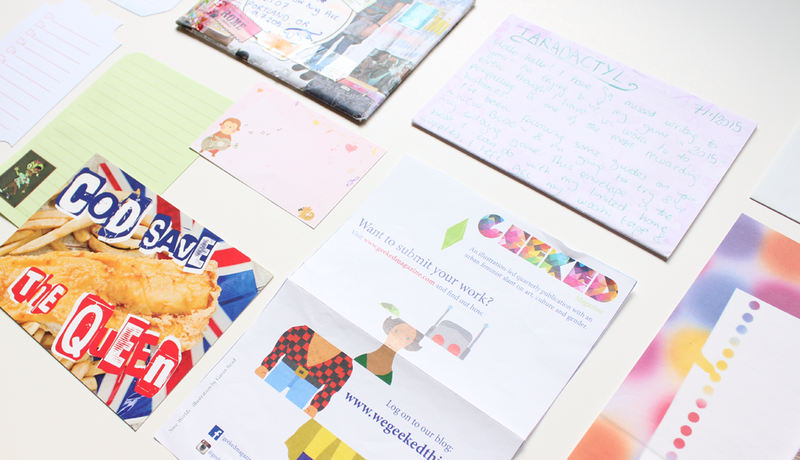 She sent a really fun letter, complete with beautiful handwriting and fun bits and bobs. I’m excited to exchange more mail with her! We may even have the chance to meet in person soon! I’m hoping to make an appearance at the Portland Correspondence Co-Op, which has it’s first meeting next Tuesday, and Miss Polly might be there. I don’t believe Miss Polly has a blog but she is welcome to correct me if I’m wrong! Mermeg is the best! I don’t know how else to describe her. Her name is Megan but she loves mermaids so she goes by Mermeg in the post. 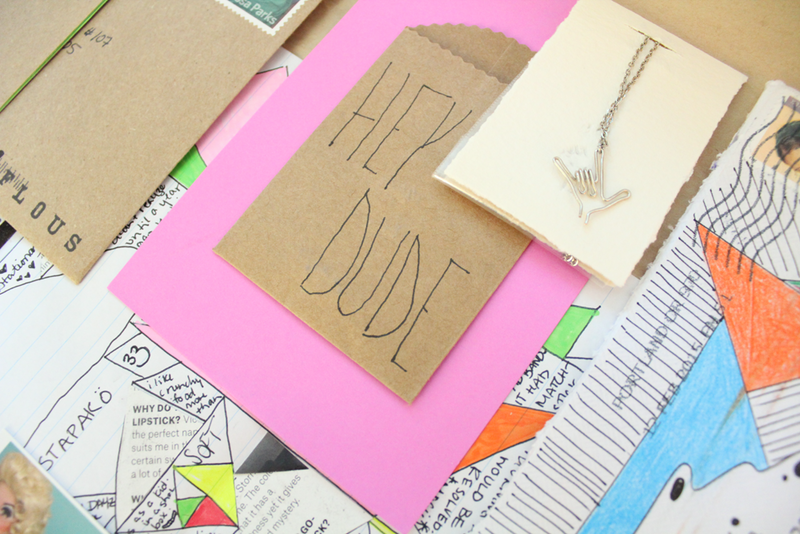 She’s a rad chick living in Wisconsin and sends the best mail. 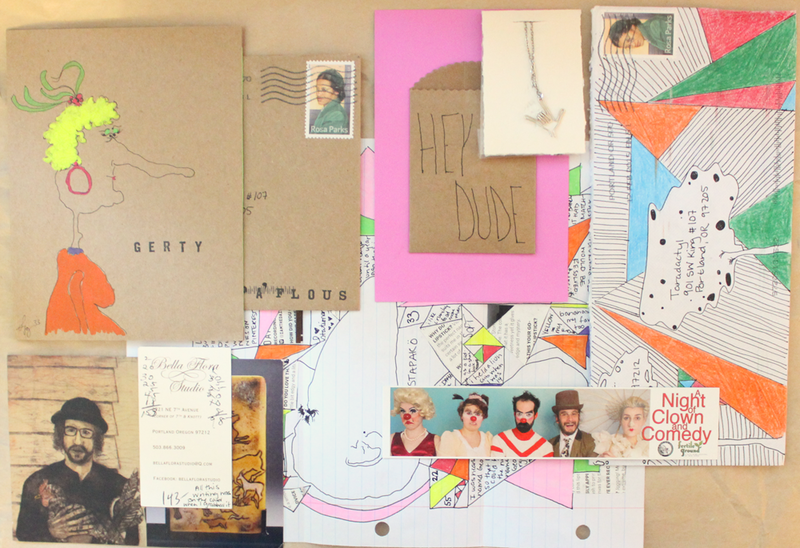 Her collages are always fun, and she always includes something special with her letters. I feel like it’s Christmas every time I get a letter from her! 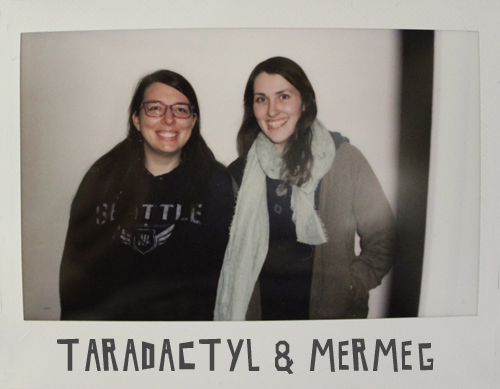 This is a special spotlight because I just hung out with Megan on New Year’s Day. We’ve hung out twice before but only for an hour or so each time. This time we got to hang out for hours! We had planned to check out SCRAP but they were closed due to the holiday. We headed up to Collage instead; a little bit pricer (ok, a lot) but it was open! 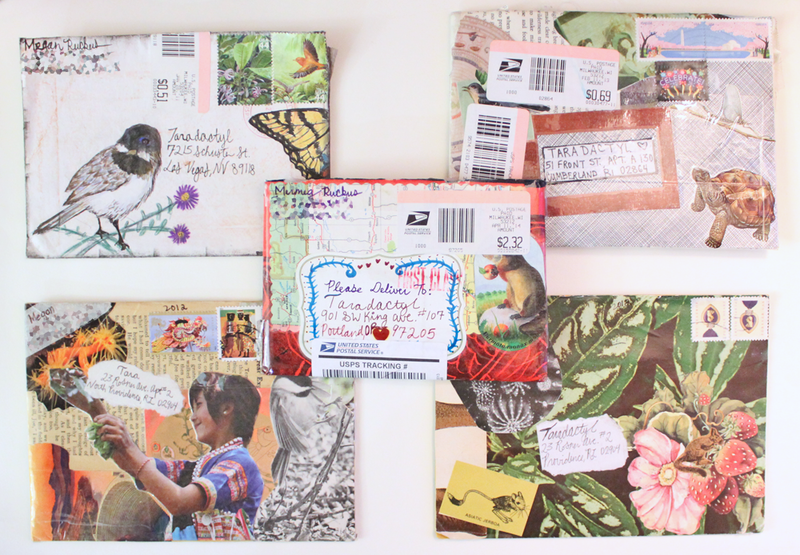 We also watched Making Mail together and a bunch of mail art videos on YouTube. We yelled at the TV like we were watching our favorite sports team play. There really isn’t anything better than sharing your hobby with someone who is as passionate about it as you are. It was a blast and I’m so happy we had the chance to hang! Megan doesn’t have a blog but you can check out her profile on Sendsomething! Send her some mermaids!! Here is what I picked up at Collage!